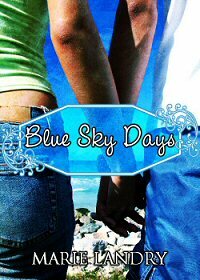 This week is the one-year publication anniversary of my debut novel, Blue Sky Days. It’s been a crazy, amazing, whirlwind year, and to celebrate and thank all of you for your support, I’m doing 4 days of giveaways, plus lowering the price of Blue Sky Days to 99 cents until Friday! This giveaway is open internationally as long as The Book Depository ships to your location. The only mandatory entry for the giveaway is to follow Ramblings of a Daydreamer - the rest are just extra chances for you to win and you don't have to do any of them if you don't want to. Thank you to everyone who has helped make this last year the incredible journey it's been. I appreciate your support and encouragement so much! Has it really been a year? I swear it hasn't! LOL Congrats. Can't believe a year has already passed. :) To anyone who hasn't read Blue Sky Days yet, you really should. It's great. As for you, Marie, I hope that 2013 brings you great things beyond your wildest imaginings! Happy writing! Congrats! That's such an exciting milestone. Yay! It doesn't seem like it's been a year. A whole year?! That's AMAZING. *bakes you cupcakes* I am so glad you're on this journey, and I cannot WAIT to read more from you. Happy Anniversary for your release!